Headed by Punit B Juneja, Advocate, we are a Full Service Law Firm in Ahmedabad. We offer services predominantly in litigation in India in the state of Gujarat, including, but not limited to the Hon'ble High Court of Gujarat. In addition to the Gujarat High Court we appear before City Civil Court, Sessions Court, District Courts, Debt Recovery Tribunal, Consumer Courts, Family Courts, Administrative Tribunal, Service Tribunals, Revenue Tribunal, Co-Operative Courts and Tribunal, Courts of Judicial/Metropolitan Magistrates, Trademark Registry and other Courts and Authorities. We are mainly in the field of Litigation - Constitutional, Civil, Criminal and Commercial. We also practice Arbitration including International Commercial Arbitration. We have many senior consultants who guide the team in the important cases and thus benefits our clients for their association with us. 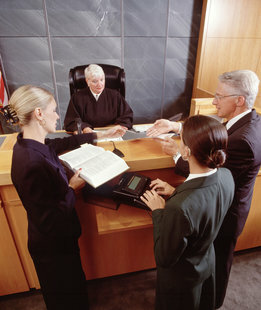 We offer legal training to our clients and their staff for mailing compliance issues simpler for them. We have many reputed Clients - Government, Semi Government Institutions, Banks, Corporate and individuals who add to our repute and good will. We don't claim to be one of the Top Law Firms of India, but we can match the services provided by Top Law Firms. We work without any fear or favor putting the interests of the client first. Our Law firm works in Three Branches of Practice. Litigation Law Firm : The firm provides the litigation services in the subjects of Constitutional Law, Civil, Criminal, Commercial, Employment (Service & Labour) laws. The firm also works in the field of Public Interest and Administrative Laws, Consumer Rights and Protection, Competition Laws, Government Tenders and Contracts, Banking, Securitisation, Debt Recovery and Restructuring. The firm has with time also gained reputation in the field of Corporate Laws, Amalgamation, Mergers and Acquisitions. The firm has also been dealing with cases of Family Law, Intellectual Property – Opposition and Litigations, Land Laws and Acquisition, Environment and Industrial Pollution, Cyber Laws, Insurance Laws, Securities and Investment Laws, Education Laws, Right to Information, Food and Education. Non Litigation Law Firm : The firm also under takes different non litigation works like Contract Drafting, Business Structuring and Compliance, International Trade and Foreign Collaborations, Trademarks and Copyrights Registrations, Website User Agreements and Hosting Agreements, Property Registration and Title Search, Due Diligence Reports, Debt Restructuring and Debt Negotiations, Securities and Investment Laws Advisory, Competition Law Advisory. Alternative Disputes Resolution Law Firm : The firm has always given encouragement to the Alternative methods of Disputes resolution which include Conciliation, Mediation and Arbitration. The firm is fully equipped with latest technologies and latest tools of legal research making it more easy for our clients to get the latest and most accurate opinion on the legal position. We are also members of two of the best Law Libraries of Ahmedabad, one being at Gujarat High Court and another being at City Civil Court Ahmedabad. Wanted a Stenographer for a Law Firm in Ahmedabad on full time/ part time basis. Candidates may apply by filling form on Contact Page. The students interested in research and para legal work in and around Ahmedabad may also contact. We are in the process of Collaborations with the Law Firms Globally. With the Change in Dynamics of the Business Transactions, we believe that the Law firms have to play important role which is positive and valuable to support the Clients Businesses all over the world. Cross Border Transactions require better support on legal issues as the losses arising out of Cross Border Litigation can be more serious than the earnings of those transactions. We invite different Law Firm / Firms Globally to collaborate with us for their needs in India and also for supporting us for our clients needs in their respective nations.